Secret Wars has ended the old Marvel Universe, but thanks to some skillful cosmic surfing, Norrin Radd and Dawn Greenwood have escaped annihilation in the pages of Silver Surfer. Now the two are faced with the opportunity to rebuild the old world with the help of Glorian, the Maker of Miracles, and after all the wonderful things she’s seen on her adventures with the Silver Surfer, Dawn is eager to bring back what’s been destroyed. As the final issue of writer Dan Slott, artist Michael Allred, and colorist Laura Allred’s run on the title, next week’s Silver Surfer #15 looks to be ending the series on a bit of a downer, but knowing this creative team, they’ve probably found a way to tell a heartwarming story about the end of everything. No matter what happens, this final issue is going to be stunning thanks to the Allreds, who have provided gorgeous visuals for every single issue. And while this preview is on the sparser side thanks to the apocalyptic scenario, the last panels suggest that the art will become fuller over the course of the issue. 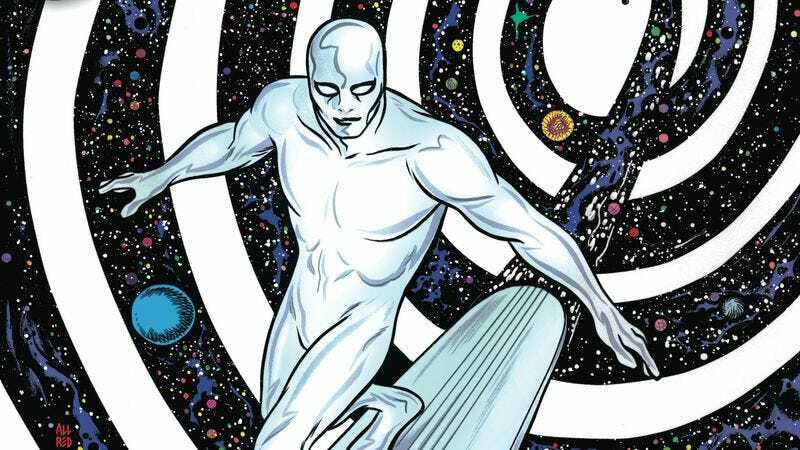 The most unfortunate thing about Silver Surfer’s conclusion is that it means the Allreds won’t be creating bold, Kirby-inpired superhero art for the foreseeable future, but fans of the art team can find them on the new Vertigo series Art Ops in October, tackling the world of fine art with writer Shaun Simon.